This podcast features an interview with Shelly Fryer, discussing the use of SeeSaw to create student portfolios, strategies for enriched assessment using iPads, and her recent experiences leading professional development workshops for Oklahoma A+ Schools. 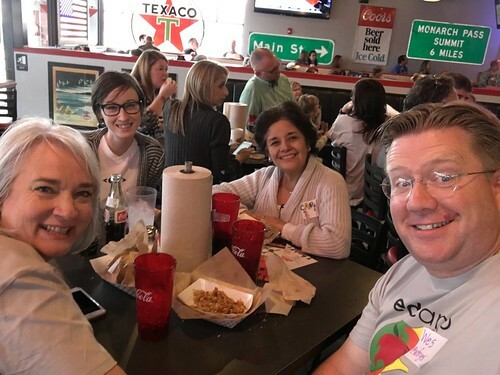 She also discusses her recent experiences at EdCampOKC, a regional “unconference” for area educators, her students’ recent eBook projects which culminated their Black History research unit, and reflected on STEM/STEAM lessons her her classroom Maker Studio. Shelly has been an elementary teacher and early childhood educator since 1985, and has been teaching 3rd and 4th grade students for the past four years in a 1:1 iPad classroom. Links to other referenced resources are included in the podcast shownotes. If you listen to and enjoy this podcast, please let Shelly and Wes know by sending a Twitter reply to @sfryer and @wfryer. Also consider subscribing to the “EdTech Situation Room” podcast (www.edtechSR.com) and the “Fuel for Educational Change Agents” podcast (audio.speedofcreativity.org). Your feedback and suggestions are welcome!